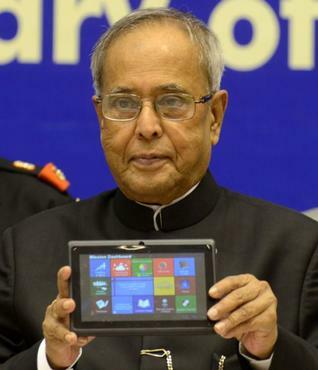 Our honorable prime minister Mr. Pranab Mukerjee launched new version of Akash tablet called Akash 2 for engineering and university students. Akash Made by Datawind UK based company collaboration with HRD Ministry in India. Akash 2 will be available for students at just Rs.1130 only. Originally Government purchase Aakash 2 for Rs 2263 from Datawind. And the government subsidises it by 50% and it will be distributed to students at Rs. 1,130. The new Aakash 2 tablet comes with 1GHz Cortex A8 processor and runs on Android 4.0 operating system. The Aakash 2 tablet has a a 7-inch capacitive display with four multi-touch points has resolution of 800×480 pixels. Aakash 2 has 512 MB of RAM and 4GB internal memory which can be expand up to 32 GB using micro SD card.